Massage Therapy. Banish stress, release tension, relax your tired aching muscles... we do all that and more with our signature massages, beautiful spa rooms and the most comfortable tables, ever! Absolute Wellness' unique approach lets you customize your experience filling the air with your favorite aromatherapy and sound therapy. We fill up your senses as you melt into total relaxation - body, mind and spirit. Choose from our selection of holistic massages and the therapist's analysis will ensure each treatment suits individual and specific needs. Want a deeply relaxing, stress relieving massage? Then our swedish massage is just the answer. Unwind into pure relaxation with amazing choreographed waves of kneading that open tired muscles, freeing up energy blockages, and relieving tension. This therapy can also incorporate stretching and compression therapy resulting in greater detoxification and an enhanced boost to the immune system. A deep muscle massage is designed to relieve chronic tension in the muscle and the connective tissue or fascia. Deep tissue massage is often recommended for individuals who experience chronic, consistent pain, are involved in heavy physical activity (such as athletes), and patients who have sustained physical injury. This type of massage focuses on muscles located below the surface of the top muscles to help release chronic tightness or pain, incorporating slower strokes to work deeper layers of muscle fibers. This massage will help release chronic patterns of tension that create painful conditions and structural misalignment. This massage incorporates moderate to deep pressure. Sports massage can be used pre-performance, post-performance, during training or for rehabilitation. It is not uncommon for receivers of deep tissue massage to have their pain replaced with a new muscle ache for a day or two. Deep tissue work varies greatly. If you want a more gentle deep tissue without the pain - your therapist will do more Myofascial Release, Neuromuscular Therapy, and Active Release Technique. Imagine a relaxing, quiet and hand-tailored massage ~ Melt into a deeply blissful state with one of our highly trained, certified massage therapists. They will determine the exact pressure level needed to provide a customized massage your body craves. Muscle tension in your neck, shoulders, lower back or hips will be relieved. 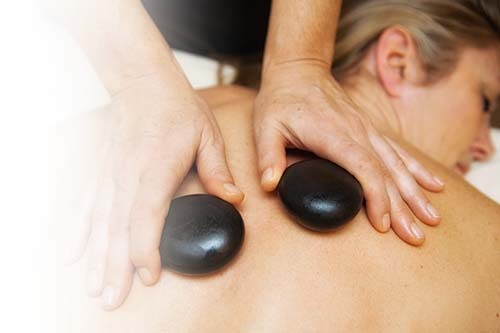 This Hot Stone Massage is one of the most relaxing and pleasurable treatments you will ever experience and one of our most requested. This massage includes aromatherapy, steamy towels, hot herbal packs and the warm, smooth river stones that are water-heated to the perfect temperature and used as an extension of your therapist’s hands to apply pressure, heat and tension releasing techniques to the whole body relaxing muscles for a true, deep restoration and hot silky-smooth massage adventure. This nurturing massage gives special attention to the comfort and stages of your pregnancy. Massage techniques and pregnancy support pillows will help you relax and care for both you and your baby. Offered past your first trimester of pregnancy. Pregnancy is a time of extra stress on the joints, including neck, shoulder, and lower back tension, no matter what the trimester. A prenatal massage is an important part of the health regimen while pregnant, as important as taking the proper vitamins and eating for two. This massage incorporates hot steamy towel foot massage and heat packs to help you unwind into deeper relaxation with amazing choreographed waves of soothing your tired, overburdened muscles, freeing up energy blockages, and relieving tension while stimulating circulation and lymphatic drainage. After you have delivered, distended muscles can be more quickly returned to their normal state with post-natal massage. Structural homeostasis will return to your body as circulation and lymphatic drainage are gently stimulated. Kick back and escape with a friend or loved one in one of our Side-by-Side Suites. Two people can enjoy a massage experience of their choice side by side in our couple’s room. A perfect way to enjoy quality time together. This room is ideally suited for special occasions, such as Anniversaries, Birthdays, and Valentine’s Day. Please call to reserve side-by-side couples massages or you can reserve two services online at the same time, on the same day, and request the Side-by-Side Suite in your notes. Abhyanga meanling self-care massage with loving hands that we offer in a relaxing spa setting. Restore balance to the body and experience a sense of well-being and harmony with this ancient healing massage. Herb-infused oils are gently warmed and lightly massaged into the skin using soothing friction strokes. As the oils penetrate the skin, toxins and impurities are loosened, reducing muscle tension and calming the nervous system. Bowen Therapy is a holistic remedial body technique that works on the soft connective tissue (fascia) of the body. Bowen therapy can be used to treat musculoskeletal or related neurological problems including acute sports injuries and chronic or organic conditions. Bowen Therapy may offer relief from arthritic pain, long-term injuries and illnesses, inflammation, improved health and flexibility, improved sporting performance, relaxation, and emotional and mental well-being. Covered by most insurances. Release mind and body with this unique body therapy, which gently works the central nervous system to relieve mental stress, neck and back pain, and even certain types of headaches and spinal nerve problems. Expect focus on the spine, skull, and surrounding connective tissue as blockages are cleared and craniosacral rhythm restored. Spa enhancements are mini- spa treatments that are designed to enhance your massage experience with scent, texture, and temperature. Spa enhancements allow your massage session to feel just a little more luxurious. **Please note that all of our spa enhancements are designed to complement your massage session, and are performed by your massage therapist or esthetician - they are not stand-alone treatments. Choose from any of our mini-spa treatments to enhance your session. You may add up to three enhancements per session. Enhancements are integrated with your service. Eco-friendly petroleum-free alternative to paraffin. A rich blend of palm, soy, jojoba, and organic coconut oils, plus shea butter, vitamin E, and essential oils moisturizes and leaves the skin soft and supple. Medical Massage Cupping will literally pull the pain out of the tissue by releasing the lymphatic system and releasing toxins in impacted areas. Cupping uses suction to soften adhesion(s), open up connective tissues, stimulates blood flow, and induces relaxation. Our On-Site Massages offer comprehensive five to thirty-minute chair and table massages, right in your workplace and entail a fully clothed treatment of the head, neck, shoulders, back and arms that relieve the symptomatic effects of work-related stress. Our licensed and insured massage therapists can be scheduled for reoccurring visits to one time events at your place of business. *20% Service Charge is added to fee.